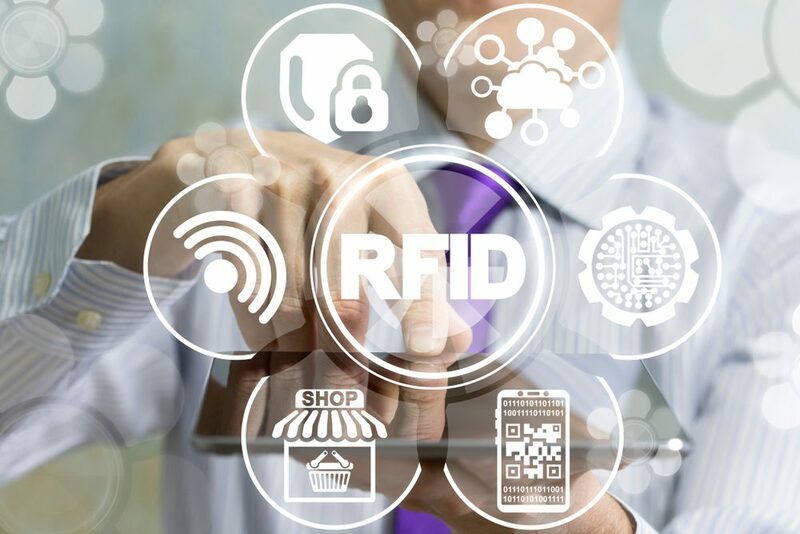 RFID, or radio frequency identification, is one of the fastest-growing technologies in retail and apparel manufacturing. RFID in retail often involves item-level tagging, in which an RFID label is affixed to each garment or other product. The label contains a microchip that identifies the item with a unique product ID or serial number and other information. The chip embedded in the RFID label wirelessly transmits information to an RFID reader, which matches items to information in your database. It’s an efficient way to manage inventory, and it can also provide an effective asset tracking solution with real-time locationing and virtually pinpoint accuracy. RFID can be completely automated. Unlike barcode systems, it doesn’t require manual scanning or establishing a line of sight. But, if needed, you can still print barcodes on an RFID label for scanning at checkouts or other purposes. Mainstreet has been part of an RFID implementation for a nationwide apparel retailer that is already delivering positive results. “Working in partnership with the software provider and Zebra Technologies, the RFID solution helps our retail client better track / update inventory while making it easy for store associates to find favorite styles and sizes” says Terry Kasen, Mainstreet VP of Client Engagement. Item-level RFID helps address some of the most common problems in the retail and apparel industries. These include inaccurate inventory, high inventory costs, and out-of-stocks. Historically, retail inventory control systems have been error-prone, which increases costs and lost sales. When a customer is ready to buy and an item is out of stock or not where it’s supposed to be in your store, you potentially lose a sale and maybe even the customer entirely. To make matters worse, using barcodes to scan and track inventory is labor-intensive and inefficient. Physical inventories take a long time and are quite costly, so many retailers and manufacturers use cycle counts, which means they only count product groups at certain times of the year. This makes inventory more manageable and less costly, but the lack of frequency comes with a price. Inventory accuracy declines at a rate of 2 to 3 percent per month after a count, and that’s in addition to any inaccuracy before the count. Retailers often realise the importance of knowing How to Calculate Inventory Turnover: Ratio, Formula, & Calculator as this can help them to maximise their profit margins and make more money. Properly designed deployments for RFID in retail can create a rapid and efficient way to perform inventory and reduce the time a stores or departments needs to perform inventory to minutes, and RFID can help manage inventory by assisting store associates with locating items in the stock room to fill any out of stock items on the sales floor. Furthermore, when paired with artificial intelligence (AI), RFID data can not only help sales associates restock, it can help them do it intelligently, filling shelves and racks with items that can maximize a store’s profits. It can also result in fewer markdowns and lost sales, improving the bottom line. Reducing out-of-stocks: Item-level RFID helps you maintain accurate inventory and track individual items to ensure they’re in stock and where they need to be to fulfill orders. Increasing sales: Having the right mix of products in-store or in the warehouse means retailers can maximize sales, maintain adequate shelf availability, and keep prices competitive. Lowering the cost of inventory: Item-level RFID automates inventory and replenishment with dramatically less labor, which lowers costs and helps avoid costly markdowns. Reducing labor: Item-level RFID improves inventory accuracy and increases the number of SKUs that can be read versus barcodes. This reduces labor for taking inventory and searching for products. Improving speed to market: Products, seasons, trends, and consumer preferences change rapidly, but item-level RFID helps get products to your store or to the customer’s front door faster than ever, so you can sell while the time is right. We’ve seen the benefits of RFID in action firsthand! Want to learn more about item-level RFID in retail?